Welcome to the College of Humanities and Sciences. Programs in this college train students to investigate and understand people from a variety of aspects. The college prepares students for entry-level jobs, professions, and graduate schools, as well as igniting their passion to learn by exploring how humans and their environment develop and interact, how and why individuals act and engage with others, and how to communicate ideas through diverse methodologies. The college includes three schools: the School of Humanities, the School of Natural Sciences, and the School of Social Sciences. The college offers undergraduate degree programs in 16 fields of study: Biology, Chemistry, Computer Science, Criminal Justice, Engineering, English, Film Studies, History, Mass Communication, Mathematics, Political Science, Psychology, Social Work, Sociology, Spanish, and Speech Communication. A number of these programs also have teaching certification tracks. Also housed in the College of Humanities and Sciences are many of the university’s pre-professional programs. Students wishing to pursue advanced studies in professional fields such as law or medicine work with advisors to fulfill the undergraduate requirements and take the steps needed to be competitive candidates for graduate programs. 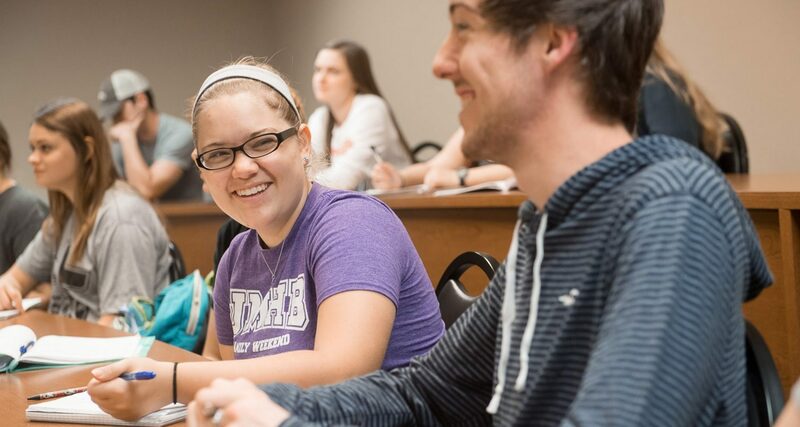 For more information about the range of pre-professional programs offered at UMHB, please visit the Pre-Health Professions Programs page. In addition, the college provides the foundation of the core curriculum that undergraduate students in all majors must study. These studies prepare all UMHB students to lead lives of meaning and purpose as informed, responsible citizens. Employers often note the knowledge and skills that a study of sciences and humanities foster as being essential to success in the workplace. They value the ability to communicate effectively both in writing and speaking, understand the scientific method, be mathematically literate, think critically, evidence insight into global perspectives, and find the answers to questions and problems through research.